(Lanka e News - 30.July.2018, 7.30AM) The pro Rajapakses following the defeat on 2015-01-08 ,who have not changed and stranded at one place in the opposition are unable to select a suitable candidate for the presidential election, and are hence conspiring to avoid holding a presidential election , said Vasudeva Nanayakkara , who is himself a key figure among the pro Rajapakse group when addressing the TTV , a new media channel. He went on to say the quandary is so deep that they have agreed to abstain from speaking about a presidential candidate . 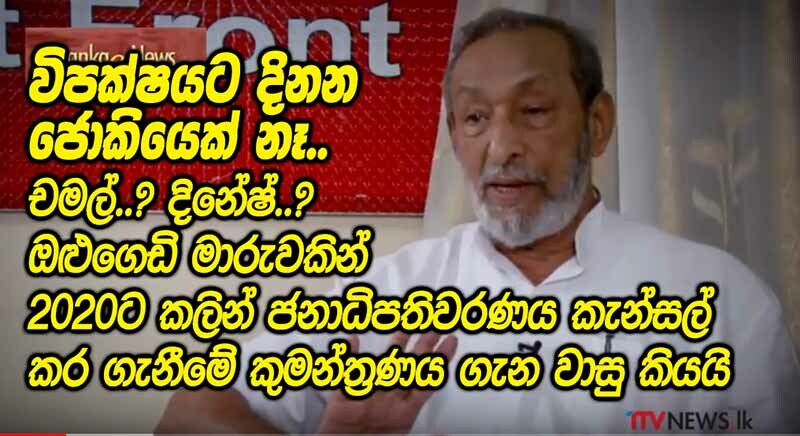 Yet , when responding to a question posed by a new young journalist , this bearded Leftist better known as ‘Old Goat’ because of his lascivious propensities despite his senile decay ,could not restrain his characteristic unbridled tongue -it popped out from his own mouth that the candidate can be Chamal Rajapakse or Dinesh Gunawardena. If a Rajapakse is to field as the candidate at the presidential elections , what is the position ? If I am to discuss that question I shall be getting embroiled in issues. Hence I am not able to go beyond that in this discussion. Unbelievably , this is the same ‘antique’ so called revolutionary Vasudeva who voluntarily gagged himself out of fear of the Rajapakses , and for no other reason. In any event this disclosure however clearly reveals the grave issues surrounding the opposition candidate. The position is crystal clear ,no matter who says what. Gotabaya Rajapakse the American citizen cannot claim eligibility for the candidature at presidential elections, let alone winning elections. On the other hand Basil Rajapakse who left no stone unturned to form the new lotus Bud force against the Bandaranaike Radala (noble) force is not going to offer the presidential candidature to moronic Gota on a platter. Basil by his announcement at Weligama had confirmed this , and that needs no further confirmation. It is to be noted Sri Lanka’s politics is decided by India irrespective of who says what. Basil is with India while Gota is with China which is a friend trailing India. When considering the two names , Chamal and Dinesh proposed by Vasu , the latter was mentioning Dinesh’s name with Chamal just for its sake. Undoubtedly , it is only Chamal who has not so far been incriminated in any corruption charges. Besides he has no citizenship issues. Hence no constitutional barriers. Yet , the issues plaguing the family are apart from what Vasu the lascivious bearded ‘old goat’ is aware of. During the time when Mahinda Rajapakse became the president , Sashindra Rajapakse was his private secretary. Mahinda and Shiranthi came to know that Sashindra is possessed of rajayogya according to his horoscope which was more powerful and eclipsing Namal . Mahinda and Shiranthi who strongly believe in horoscopes and myths immediately removed Sashindra from the post .Though other reasons may have had an impact the main reason was this rajayoga threat . Mahinda Rajapakse who is famous for his cunning and crookedness , while steering Namal into Parliament shunted Sashindra to the provincial councils. That is, if any day Sashindra is to become a political leader , Namal will have a more senior position and suitability .Today , it is the objective of Mahinda to hold on without lagging behind until Namal reaches the age to contest presidential elections. If Mahinda has thought that far way back in 2005-2007 , surely , he is not going to give in to Chamal Rajapakse and make him the presidential candidate now when he knows Chamal is digging the grave for Namal , though the ‘old goat’ Vasu the clown thinks otherwise. Under the constitution Mahinda who crows any diddle will do cannot contest presidential elections again. Gota the American citizen who crows yankee doodle too cannot be a presidential candidate .Basil who is also an American citizen too cannot field as presidential candidate. But because Sashindra Rajapakse has the rajayogaya , Chamal who is his father will also not be granted the presidential candidacy. In the circumstances , the pro Rajapakse opposition which has countless lackeys hasn‘t a ‘jockey’ for the presidential elections. Vasudeva in the final stage of his interview said ,though not in so many words that Rajapakses are in a deep quandary when it pertains to the next presidential elections. According to him , before the 2020 presidential elections , through a head count subterfuge in parliament , Mahinda Rajapakse must be made the prime minister , then via a constitutional amendment the presidential elections shall be cancelled , and by going for a general election , they can clinch the advantage. In other words it is very obvious from his enunciations , they have no confidence at all that they can win the presidential elections . Therefore Vasudeva has finally via his speech proved one simple truth beyond all doubts - how monumental the fear of the Opposition is in regard to the next presidential elections !